Becoming Your Dog’s God: Mastering the Art of Pack Leader in No Time Flat shows you how to FINALLY transition from a dog lover to a REAL pack leader! 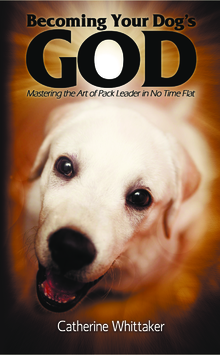 It gives you simple yet profound methods to bridge the communication gap between you and your dog. It also reveals how your personal energy and state of mind may have prevented your dog from taking you seriously in the past. Without knowing it, most dog lovers have set up their dogs to fail! To truly graduate as a pack leader, you need to understand how energy works, and how perceptive your dog really is. This book is suitable if you own a puppy or an adult dog. It exposes “little known” secrets that show you HOW to enhance your energy quickly and easily so that you can gain pack leader status. It explains how to understand your dog’s body language and behaviours. And it demonstrates, with lots of practical examples, how to prevent and correct the most common dog behaviour challenges gently and efficiently. What is the magic formula that dog trainers and experts intuitively use to get amazing results that the majority of dog owners lack? You hold the magic formula in your hands now! Once you know the simple secrets, you will be surprised how quickly you see the transformation in yourself and your dog!